Recently I’ve wondered what has become of Home Economics. Not the actual classes I was subjected to (more on that later) but the concept itself. I’ve tossed the query out to various friends and acquaintances and have received murmurs of “budget cuts” in reply. Hardly empirical data I know, but today’s opinion piece provides confirmation of our suspicions. Now I would never extol the virtues of tedious sewing projects which only resulted in tears and an ancient teacher so frustrated by my stellar ineptitude, she used the my arm as a pincushion in an attempt to make her point. I would never suggest someone else endure the humiliation of laboring over one simple skirt for an entire semester while the rest of the class created the equivalent of the Spring Line of Thomas Jefferson Junior High School. I would never wish upon anyone the hollow sense of accomplishment that comes with an end of year unveiling of a skirt that no longer fit. But cooking, and nutrition? Well that’s a horse of a different color. I think we can all agree, we’ve got a little weight issue in this country. There is nothing like learning about the origin of food, nutrition, and cooking to aid in the decision process involved in eating. If that weren’t reason alone to re-imagine Home Economics classes, consider for a moment the inherent math and science lessons to be had in growing and preparing food. Chlorophyll, banana cultivation, baking chemistry, weights and measures…Years of lesson plans are just waiting to be delivered in the most entertaining (BAM!) delicious ways. There has never been a better time to consider this curriculum. My family (of origin) sat down to dinner together every single night. Lunches were consumed at home, or were packed in a brown bag (note: mashed banana and peanut butter on whole wheat really needs the protection of a proper lunchbox) weekend breakfasts were a family affair. 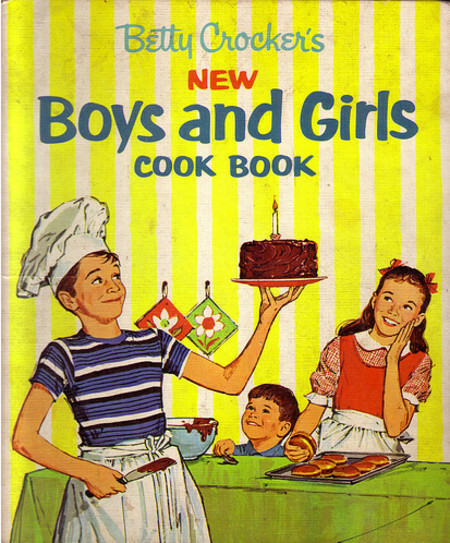 There was no junk food (except for birthday celebrations) and nutrition was often discussed. Again, without any scientific proof, I’m willing to say that the majority of children are not experiencing their meals in this manner today. Unlike technology in the classroom (we’ll save debating the return on investment of teaching students power point, for another day) the teaching of Home Economics need not be an astronomical financial investment. Yes, the title “Home Economics” is a bit cloying, and does conjure apron-y imagery. But with the modern interpretation of say; Domestic Engineering, we can begin to imagine how making education (specifically math and science) personal, makes all the sense in the world.